Project Data: Sterling Hills Filing No. 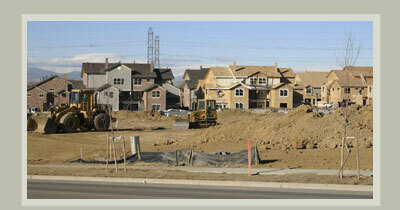 11 is a multi-family site consisting of 227 units on 17.4 acres. The site is located southeast of the intersection of Sterling Hills Parkway and East Villanova Place and is bordered on the south by a vacant Public Service right-of-way. JeHN was responsible for the site plan, final construction plans, project management, project coordination, construction survey, and construction management. The challenging aspect of this project was to maximizing a 17.4 acre parcel with 227 "single-family attached" units and conform to an existing regional detention pond facility. Sterling Hills Filing No. 12 is a multi-family site containing approximately 11.7 acres. The site is located northeast of the intersection of Tower Rd. and Sterling Hills Parkway. Designing a drainage system to carry an excess of 200 cubic feet per second with minimum grade and provide a major emergency overflow channel were design issues that our team met.